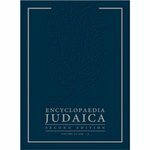 "Encyclopedia Judaica. 2nd edition" by Fred Skolnik, Angela Kim Harkins et al. Book description: Provides an exhaustive and organized overview of Jewish life and knowledge from the Second Temple period to the contemporary State of Israel, from Rabbinic to modern Yiddish literature, from Kabbalah to "Americana" and from Zionism to the contribution of Jews to world cultures, Encyclopaedia Judaica, 2nd edition is important to scholars, general readers and students. Harkins, Angela Kim and Harkins, Franklin T. (2007) “Old Latin/Vulgate,” section in “Bible, ancient translations.” Encyclopedia Judaica. 2nd edition. Editor-in-chief, Fred Skolnik. Jerusalem: the Jerusalem Publishing House/Thomson Gale. Skolnik, Fred; Harkins, Angela Kim; and Harkins, Franklin T., "Encyclopedia Judaica. 2nd edition" (2007). Religious Studies Faculty Book Gallery. 9.